1) To loop or arrange sequence of idle motions (mtn files) of my Live2d character, can I just do it using Live2d Editor? Or do I need to use another software like Unity? 2) Can Live2d Viewer be used to see hit area response? 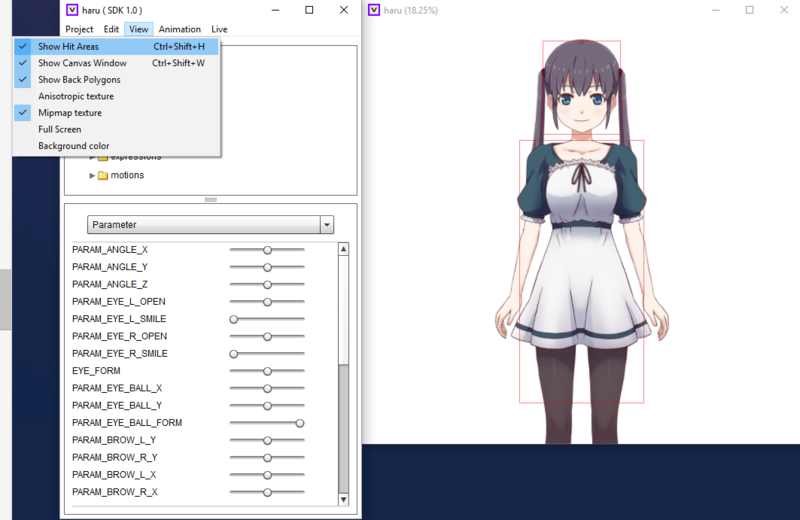 When I touch parts of the character’s body on the Live2d Viewer, I can get a response from the character? 3) Can I set/ edit hit area + response using Live2d editor? Or do I need to use another software like Unity? To link motion file mtn to the hit areas on my character, is coding/ programming knowledge needed? Please let me know. Thank you!! 1) If you want to dynamically switch between different idle motions, which I think you are aiming for, you'd need to use the Cubism SDK. If you want to create a long animation where you're character switches from one idle motion to another, you could create the animation within the editor. 2) Unfortunately, you can only preview hit areas in the viewer (see the screenshot below). Having your model react to touches would require the use of the SDK. 3) To "link" motion files to hit areas, you'd also need to use the SDK.